Who can forget the woman who saved one of the two sticks of gum Elder Monson passed out to youth in postwar Germany? 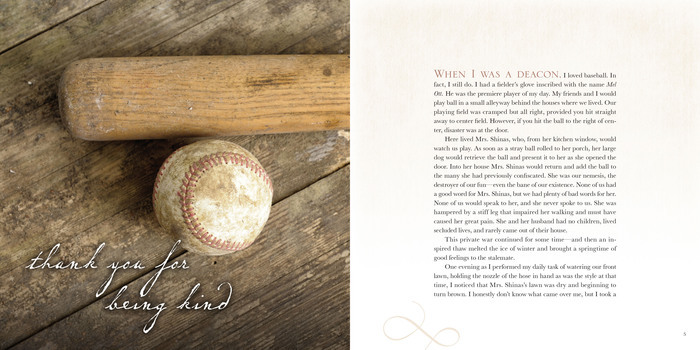 Or the neighbor who returned a box of baseballs to young Tommy as a thank-you for his kindness to her? Or the father who declined to attend a “Mormon” meeting with his family but had his heart softened by a message he heard on a radio that was actually broken? I have always loved listening to President Monson; his voice is soothing and he is a great storyteller. 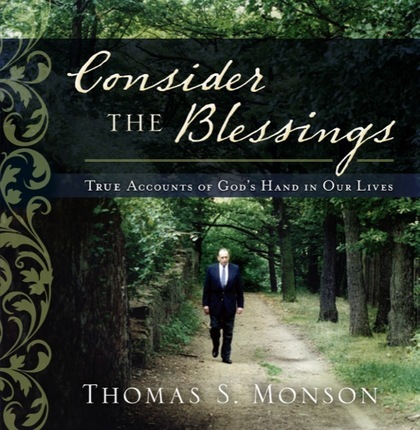 In Consider the Blessings, there are fifty true accounts that President Monson has shared over the years. Some I remember (which is nice to recall hearing them) and some are new to me. Each one is different and each one leaves me feeling uplifted and renewed in my faith in the gospel. 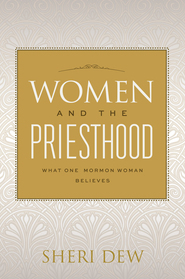 You can read this book one story at a time or read them all at once; either way you will feel of the Spirit and feel the strength of testimony through these stories President Monson shares. A must-have for those who enjoy personal accounts of faith in our day; this book is great to read by yourself and to share with your family. The stories are told by him and are accompanied by beautiful photography. I thought that I would recognize a lot of the stories from listening to him speak, but I only recognized a couple of them. I found myself reading story after story after story! They are uplifting and inspiring! This is a great read, and would make a great book to set out like a coffee table book, for light reading. 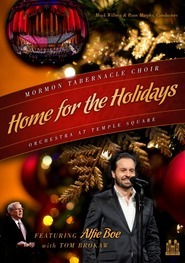 This would make a great Christmas gift for pretty much anyone! My first thought when I opened the mailing envelope, This is a gorgeous book. I soon found the beauty of the book is on the inside. The stories touched me deeply and made me want to go and do good as President Monson has done throughout his life. I sat down to read a couple of stories before bed and found myself reading a dozen. 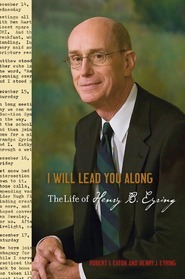 Anyone who reads this book will be touched by these accounts of a prophet of God loving and teaching. Who doesn't love President Monson and the way he is able to teach us life lessons through a simple story? I was really excited to read this book that celebrates President Monson's 50th anniversary of when he was called as a prophet. I remember hearing many of these stories, but some of them were new to me. I love the way the book is, each of the 50 short stories has beautiful photographs to look at as you are reading. I'm excited to use these stories as part of our family home evening lessons coming up! Because I love to read, I absolutely love stories! I find it so fascinating that of all the people that live on earth, no two people have the exact same experiences and I enjoy reading about what other people experience. 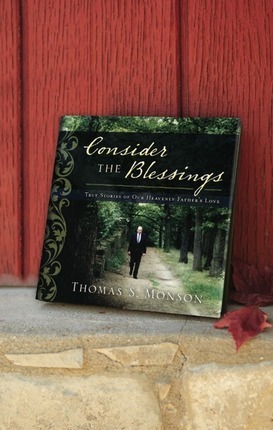 Consider the Blessings is a collection of true stories that are inspiring and full of hope. President Monson is known for his storytelling and I have always enjoyed listening to him speak because I love that! His stories have made me laugh and cry over the years. This book has some of his stories that I've heard before and some that I haven't and again, I found myself laughing and crying. The stories are all short (anywhere from 1-4 pages) and I've enjoyed reading a story or two when I've needed a dose of inspiration. This is a book full of beautiful stories and pictures. I also like that there's an index in back, so if you need to find one of his stories on service, missionary work, love or forgiveness, you can easily do that. 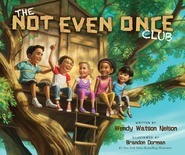 This is a great book for the entire family and one we will cherish for many years to come! 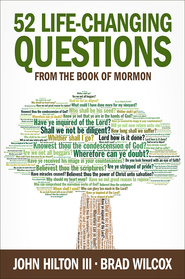 I love, love, love our dear prophet, President Thomas S. Monson so I was really excited for an opportunity to review this book full of wisdom and personal experience. 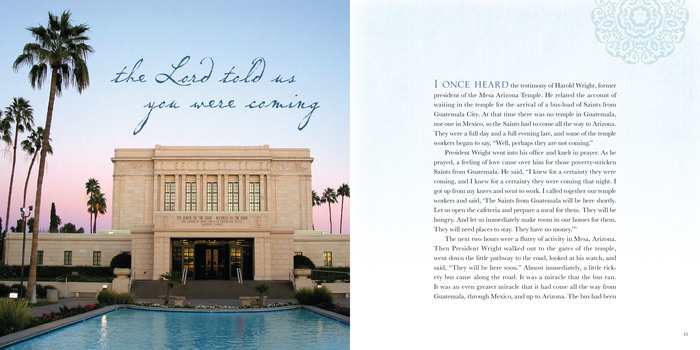 It is our prophets 50th year as an apostle of the Lord and this book shares 50 TrUe Stories of President Monson's life. At first glance I was disappointed that there were not any pictures of our prophet throughout the pages, but as I got more into the book I realized that the photos were lovely and really gave the book a feeling of "this could happen to anybody" and you don't have to be a prophet of God in order to have such testimony building experiences. Each story is short, only a couple of pages but full of gospel truth. President Monson's faith is amazing and his example is worthy of emulation. Some stories made me chuckle while some stories brought tears to my eyes. But, each story is unique, beautiful and simple. I love this book! I love that I have heard several of the stories in the past and had nearly forgotten them but now I get to enjoy them with renewed appreciation. I love that there are many new stories that I've never heard before and reading them warms my heart and brings tears to my eyes. I love that I can almost hear President Thomas S. Monson narrating each story with so much feeling in his voice. I love that the stories are short enough to be enjoyed when I only have a few minutes to spare, yet long enough to provide something to ponder over. The photographs that accompany each experience brings the book to life. I love this book! Exquisite. Feed Your Heart And Soul. Read This Book. This is an absolutely exquisite book. The attention to detail in the art and design (embossed book cover writings, photograph images, glossy paper, font, etc.) was impeccable. Each of the fifty stories had its proper serenity in the pages. Accordingly, the content was its greatest masterpiece. 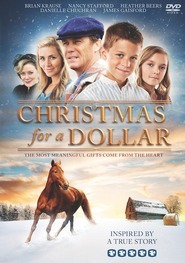 The book really did show affirmations of God's hand in our lives which to me clearly shouted that there is a loving God. The events addressed were not coincidences as one might argue but examples of quite miracles happening in our time. Oh, how my heart rejoiced. This is definitely a tried and tested family book. I read three to four stories each night to my children at bedtime for nearly two weeks. I often found myself struggling in reading because I was dissolved in tears. The stories were that piercing. There's just nothing like knowing the love of God for us through the kindness that people show for each other. It's certainly a testament to me that life is meaningful. Feed your heart and soul. Read this book. *Hardcover copy provided by publisher in exchange for an honest review. This book is so beautiful. The pictures and the layout are gorgeous. It is a treasure. I loved this book. I loved reading the stories of President Monson's that I have enjoyed throughout the years and reading some I wasn't familiar with. I did know most of them though. President Monson is a gifted storyteller. I had his voice in my mind while I reading. I imagined his sweet voice and sense of humor throughout. I never cease to be amazed by now the Lord can motivate and direct the length of breadth of His kingdom and yet have time to provide inspiration concerning one individual. 5 out of 5 stars. I will be sharing these beloved stories again with my family during Family Home Evening. First of all, from a design standpoint, the book is gorgeous! 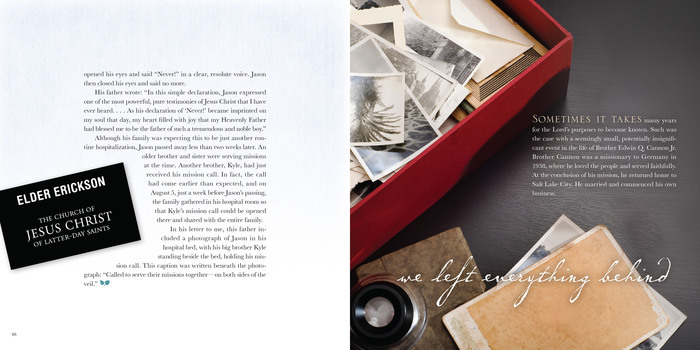 Each page is carefully and thoughtfully crafted. The photography couldn't be better--it is colorful and poignant. I love the font for each section title. The hardcover book, itself, is just the right size to be left out on a living room table, and with each section being only two to three pages, it's just right for filling up five or fifty minutes of spare time that couldn't be better spent. More than the design, this book contains 144 pages of stories from our prophet's life--fifty short snippets of his words, his actions, his character, his testimony. Some of President Monson's stories I had not remembered hearing before, and others were old favorites, but each was uplifting and strengthening. Many times, a word or phrase brought tears to my eyes as the Spirit of the Lord testified to me the beauty and hope of the gospel of Jesus Christ. Before I received the book, I joked with my kids, "How could I give the prophet's book anything but five stars?" After I actually had the book in my hands and started reading, I found five stars is just not enough. In all honesty, it is the best book I've read all year. And let me tell you a secret--if you promise not to tell my family--I've found myself looking at my Christmas list, deciding who else I might want to share this book with. Story Time With The Prophet!!! Do you love hearing the prophet share true stories from his life? I do. For years I've been amazed at his ability to recall specific details and names. He has such a gift for weaving the gospel into his stories and bearing testimony of God's Hand in our Lives. In this new book, Consider The Blessings , he uses his great ability to teach in parables and through meaningful, spiritual experiences, to share 50 true accounts of God's hand working in his life, and a few stories of God's hand working in other's lives. I have read nearly every one and I think I have cried reading 90% of them. What I love about this book is that the stories are short, well-written and easy to use in a devotional, a church talk, at Family Home Evening, or just sharing with a friend who is in need of some spiritual strength and hope. I have also been inspired to start keeping a better journal. I'm guilty of forgetting just about everything, and I need to start writing down all of the special experiences I have with God's hand working in my life. And there have already been too many to count. I think you will love this book. Awesome spirit building book to be treasured. A disclaimer should be attached to this book stating that it should not be read without a box of tissues close at hand. It is a very emotional, spiritual uplifting read. A must have for everyone's library. Got this book in the mail today and it is full of spirit and reaches the heart with every story. Beautifully done, clear pictures, just amazing.